Clip In Hair Extensions, easy to apply, and low maintenance: Its no wonder why Clip In Hair Extensions are the first choice for adding length, even volume and color, to your own hair! Clip In Hair Extensions attach using pressure sensitive clips and do not cause damage to your own hair. A quality set of clip hair extensions can last substantially longer and require less maintenance than permanent methods. Clip In Hair Extensions are the perfect solution when you are deciding to grow your hair out, or for a way to add length instantly. Application takes a matter of minutes and it’s so easy to do anyone can master the process. Temporary Clip In Hair Extensions allow you to clip them in and take them out whenever you want. Fusion Strands by Strands this type of Hair Extensions comes pretipped with a Keratin Polymer. The polymer is the synthetic equivalent to what our hair is made up of, Proteins. To attach Fusion Strands by Strands, one by one I take a tiny section of your hair and by applying heat to the Keratin tip I mold it onto your hair about 1/4 inch away from the scalp. Maintenance for the Fusion Strands by Strands is done every 2-3 months and we order new hair each time. Along with how well Fusion Strands by Strands stay in, another cool thing about them is since we don’t reuse them, you have the freedom to change your color and length as time goes on. With both I use several different placement patterns according to your specific needs. Hair Extensions have many uses: Lengthening, Thickening, Adding Hi/Lo Lites, Give you an Younger & Healthier appearance, Adding Bright colors that won’t fade, Fill in breakage, Aid growing hair out, Protect hair. When it comes to hair extensions, this is one of the most important questions to answer – and for most women, that answer needs to be yes, no matter what! And one way to ensure seamless integration of luxuriant, perfect locks is to try Weft Hair Extensions. Weft Hair Extensions utilize the same technology used to secure lace-front wigs at the hairline. Strips of clear, double-sided tape are attached to the base of a weft of Remy or virgin Indian human hair, and then these wefts are taped to the scalp. Because the tape used is completely flexible and see-through, your natural scalp is completely visible, and because the tape attaches to the scalp, there is no need for bulky braids or clips which may glint in the light. You can part the hair creatively and pull your locks into partial and full updos without fear! How do Weft Hair Extensions Work? Some hair-extension brands offer pre-taped, peel-and-stick wefts, but if you want the best hair, you can buy your own perfect locks and a roll of quality wig and weave tape. With the help of a stylist, you can then apply the hair extensions wherever you want them. As with any hair extension application, you can do a full-head or partial install. For an extra shot of volume, try “sandwiching” your natural hair between two Wefts of Hair Extensions; simply section off an area of hair and tape the human hair extensions above and below. How Do I Care for Weft Hair Extensions? Wig and weave tape does not wash out easily with normal shampoos and conditioners, so you can wash and style your hair as usual with a tape-in weave. Just be careful not to apply scalp oils too heavily or too often, as these do loosen the tape bond, and your Weft Hair Extensions can last for up to two months, if cared for properly. However, it is recommended that you remove the tape and oil the scalp after a month, and then wait at least another month before applying any Weft Hair Extensions again. This will restore the scalp and prevent hair loss from repeated taping and tape removal. Like any other application method, Weft Hair Extensions have their strengths and weaknesses, and overusing them can lead to hair damage. But as a seamless-looking, semi-permanent weaving method, Weft Hair Extensions can be just the solution you’re looking for. Check it out! Applying a full set of lashes takes about two hours, and can be maintained year-round with touch-ups recommended every three to four weeks. A half set of lashes are an economical alternative to achieve a similarly dramatic effect, applied as filler to thicken natural lashes, or applied outward from the eye for a specialized look. Everyone has different lashes, and depending on the condition of your own natural lashes, lash experts can only go a certain length or thickness. Whether you are adding some quick highlights for the office or designing a new look for a night on the town, Clip-In Hair Extensions are the fastest and easiest way to bring your hair to life. Clip-In Hair Extensions is applied using small pressure clips that are pre-attached to the hair extension. Clip-In Hair Extensions are ordered in narrow single-clip extensions or a full-head assortment of wefts. 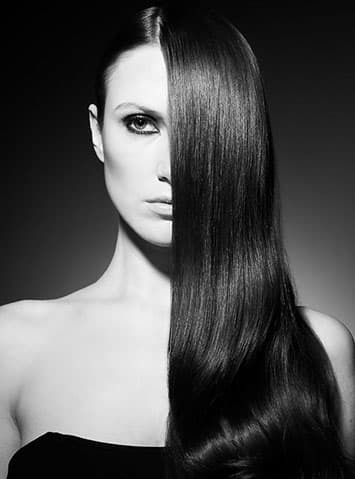 You may apply Clip-In Hair Extensions with or without the help of a stylist. Clip in Hair Extensions are a new and easy way to instantly get longer and thicker hair. Clip in Hair Extensions are an inexpensive and an efficient way of glamorizing your appearance. It’s a simple do it yourself technique that anyone can do at home in only a few minutes. From full head hair extension sets to one piece quick fixes and highlights, we offer a full range of hair extensions that are easy for you to fit – see our hair extensions fitting guide. •Clip on fringe extensions allow you to experiment with your look – without the risk of cutting your hair! Small sectional pieces of hair are attached one by one to small sections of your own hair by using bonding (warm or cold), clamping, shrink tubing, micro tubes. Weaving or glue were and still are practiced but are older inferior methods of practice.